Two players who were on the west coast for Opening Week of the 2015 college baseball season – Fresno State junior centerfielder Brody Russell and Tulane junior righthanded pitcher/DH Tim Yandel – highlight the CB360 week-1 Primetime Performers Honor Roll. Russell is the CB360 National Primetime Player of the Week and Yandel the Primetime Pitcher of the Week, following their week-1 exploits – with an assortment of 12 other players from around the country rounding out the Primetime Performers Honor Roll for Feb. 13–15, 2015. CLICK HERE for complete Opening Week results summary from teams in the CB360 top-50 Composite National Rankings. 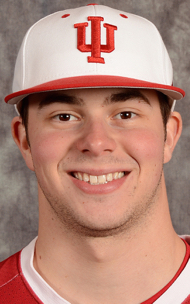 Opening Week of any college baseball season always produces its share of impressive performances. During the first few days of the 2015 season, only a handful of the nation’s top teams opened vs. nationally-ranked opponents, yielding some of the notable week-1 players. Individuals from various other teams also stepped up during Opening Week, while doing battle against quality opposition. 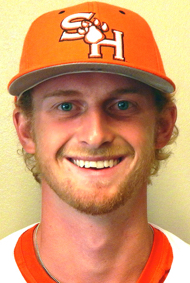 In addition to Russell and Yandel, the other week-1 Primetime Performers include: Sam Houston State jr. LHP Logan Boyd (Humble, TX) … Baylor sr. CF Logan Brown (Rowlett, TX) … West Virginia so. RHP Chad Donato (Cypress, TX) … Indiana jr. RHP Scott Effross (Twinsburg, OH) … Forehead State sr. RHP Aaron Goe (Dry Ridge, KY) … UTSA jr. CF Kevin Markham (Willis, TX) … FIU so. 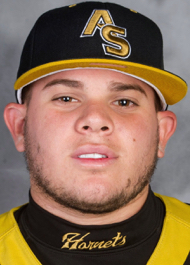 RHP Chris Mourelle (Miami, FL) … Alabama State sr. 3B/2B Einar Muniz (Tampa, FL) … UNLV so. RHP D.J. 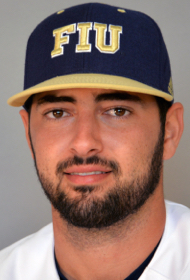 Myers (Henderson, NV) … Rice fifth-year sr. LF/DH Kirby Taylor (Bellaire, TX) … Santa Clara jr. SS Jose Vizcaino, Jr. (La Jolla, CA) … and Arizona State so. 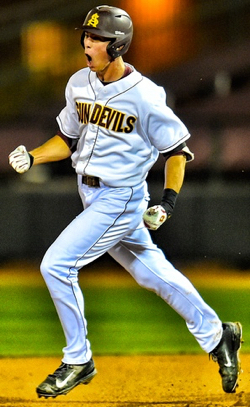 SS Colby Woodmansee (Phoenix, AZ). Fresno State junior centerfielder BRODY RUSSELL delivered both quantity and quality during the Opening Week sweep of UC Irine, batting 7-for-12 (5 RBI, 3 R, HR) while delivering several key late-inning hits throughout the series. 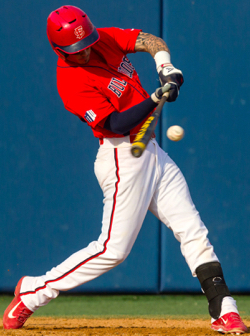 RUSSELL (Bakersfield, Calif.) delivered both quantity and quality when it came to his offensive production during Fresno State’s Opening Week series sweep (5–4, 7–5, 7–5) vs. UC Irvine, the #41 team in the CB360 preseason Composite National Rankings. The Bulldogs won three straight tight finishes, versus a team that still includes several key players from the UCI squad that reached the 2014 College World. In addition to hitting .583 (7-for-12) against the Anteaters, Russell also reached via a walk, while factoring into seven of the team’s runs (5 RBI, 3 runs, home run). 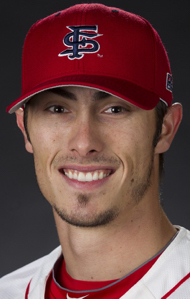 The lanky 6-foot-2, 185-point right-handed hitter added another productive plate appearance with a sacrifice bunt from his 2-hole spot in the lineup. Russell’s game-1 contributions (3–3; RBI, R, BB, sac) included the leadoff, 9th-inning single that sparked the winning rally. 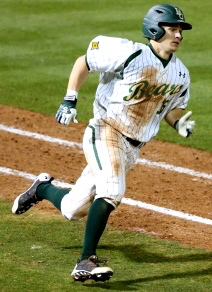 The next day, he singled home the tying run in the 7th and scored the go-ahead tally moments later on Taylor Ward’s triple. Russell closed the weekend by batting 3-for-5 in the series finale – including an RBI single that sparked a 2-out rally in the 7th, cutting UCI’s lead to 5–1, before launching a two-run blast in the 8th for a 6–5 Bulldogs lead. 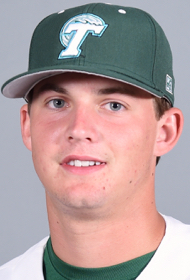 Tulane junior two-way talent TIM YANDEL launched the first home run of his career early in the series at Pepperdine and logged 6.1 shutout, no-hit innings in the series finale (his first career start) – as the Green Wave nearly completed the Opening Week series sweep. YANDEL (Woodstock, Ga.) displayed his two-way talent in Tulane’s series win at Pepperdine (cb360 #45) – highlighted by hitting his first career home run and logging 6.1 shutout, no-hit innings in his first career collegiate start. The Green Wave nearly swept a Pepperdine team that returns several top players from the squad that was three outs from reaching the 2014 College World Series. 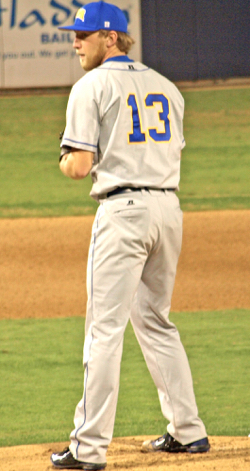 Despite having pitched a total of only 18 innings (all in relief) during his fist two seasons,Yandel took the ball with confidence as the game-3 starter at Pepperdine, holding the host team without a run or hit while pitching into the 7th (Pepperdine rallied in the 9th for a 2–1 win that spoiled his outing). The 6-1, 190-pound righthander also issued only two walks (plus a hit batter) while striking out five. Yandel impressively allowed only two balls out of the infield throughout his 6.1 innings and likely could have pitched even deeper into the game, but his pitch count was extended by three errors from the defense behind him. The 14 week-1 Primetime Performers include: seven pitchers (one LHP, and one a two-way player), plus three centerfielders, a couple shortstops, a leftfielder and a 3B/2B. Six of the honorees are juniors, plus four sophomores, three seniors and a fifth-year senior. The Lone Star State is well-represented among this group, which includes five who hail from Texas hometowns – plus two each from California and Florida, along with one each from Arizona, Georgia, Kentucky, Nevada and Ohio. 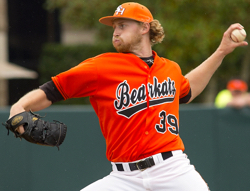 Racked up nine strikeouts in series-deciding, 9–3 third game vs. Wichita State (cb360 #43) – limiting the Shockers to one run on five hits and no walks over 6.0 innings … after pitching out of early trouble in the 2nd and 3rd innings, retired 10 straight batters … faced only 22 batters (four over the minimum) and totaled 13 of his 18 outs within the infield (9 Ks, 3 groundouts and a caught stealing) … made only three starts in his first two seasons with the Bearkats (plus 27 appearances out of the bullpen), totaling 62 strikeouts in 60 innings spanning the 2013-14 seasons … in-state product from Atascocita High School. Gold-glove centerfielder who played lead role offensively in sweep of cb360 #28 Cal Poly (8–6, 8–6, 6–0) – reaching base nine times from the 2-hole (hit 4-for-8 with five walks) while factoring into eight of the Bears runs, with six RBI and a pair of runs scored … also had a triple, double and sacrifice bunt during his productive Opening Week … pulled a 2-out/2-run triple down the rightfield line in bottom of the 8th, providing the eventual final margin in season opener (2-for-3, R, BB, SAC) … followed with a 4-RBI day in game-2, after again batting 2-for-3 with a double and a pair of walks … closed the series with two more walks and a run scored in the game-3 shutout … third-year starter and fourth-year regular who earned spot on 2014 /ABCA Division I Gold Glove Team … in-state product from Rowlett High School. 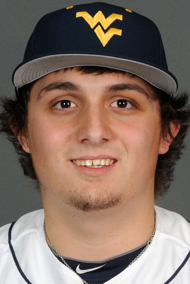 West Virginia … RHP … So. Made the first start of his college career in challenging setting, at cb360 #27 Clemson, and responded with strong outing by pitching into the 7th inning, as WVU won 6–1 to take the Opening Week series (2–0, 2–4 in first two games) … did not allow a runner into scoring position until the 7th inning, departing after a pair of singles (the lone Clemson run scored moments later) … scattered seven hits and only one walk, with five strikeouts … made four short relief appearances as a freshman in 2014, totaling only 3.1 innings … yet another Texas product (from Cypress Woods HS) among the week-1 Primetime Performers. 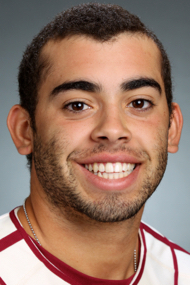 Indiana … RHP … Jr.
Rose to the Opening Day challenge at Stanford (cb360 #22), making only the second start of his college career while being opposed by Cardinal ace Cal Quantrill … his game-1 victory helped spark the Hoosiers to a series win (4–2, 4–3, 3–4), as IU overcame the challenge of replacing departed head coach Tracy Smith (now at Arizona State) and four All-Americans, among them No. 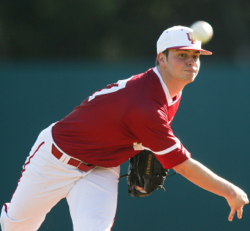 1 starter Joey DeNato, who totaled nearly 40 wins (37) and 300 strikeouts (297) during his Hoosiers career … did not walk a Stanford batter while allowing only one run on five hits, with three Ks in six full innings … ended each of the first five innings with a strikeout, helping squelch some early Stanford scoring threats … has compiled a 2.19 career ERA, 12–4 record and 10 saves in 61 appearances (59 of them in relief) … a Cape Cod League all-star while pitching for the Wareham Gatemen during the summer of 2015 … made an IU-record 32 appearances during his sophomore season in 2014 (1.98; 5 saves) … his 2013 honors included Freshman All-America and second team All-Big Ten (2.44; 6-1; 5 saves) – as member of history-making IU team that reached the College World Series … Midwest product from Twinsburg (Ohio) High School. 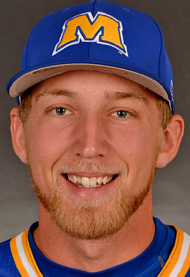 Morehead State … RHP … Sr./Jr. 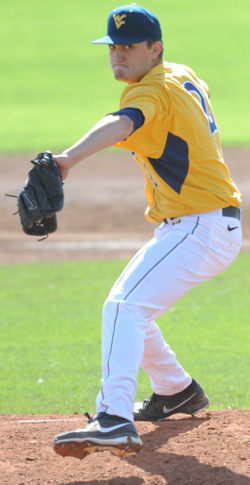 Made his first appearance in nearly two years and responded with 6.2 strong innings, limiting perennial West Coast Conference title contender San Diego (cb360 #48) to one run, in 10–3 opener … that inspirational return sparked his Morehead teammates, who went on to win the four-game series in a near-sweep (10-3, 8-5, 4-2, 5-6) … had not pitched for Morehead since Feb. 23, 2013 (due to a nagging arm ailment), but ended that two-year layoff with an impressive 91-pitch outing while facing only 22 batters (four over the minimum) and allowing just five baserunners (four singles, one double, no walks) … his three strikeouts included two in a 1–2–3 bottom of the 4th … retired the first eight batters he faced, before a 2-out double and RBI single in the 3rd – but he alertly gunned down Kyle Holder trying to take second as the run was scoring … allowed only two baserunners into scoring position (just one inning with multiple baserunners) … recovered from leadoff singles in the 5th and 6th with three straight outs … made two early appearances in 2013 prior to the injury, after 16 games pitched (15 starts) as a freshman in 2012, with team-best six wins … all-state product from Grant County High School. 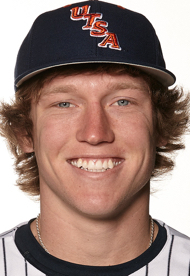 Transfer newcomer who made immediate impact at the Division I level, as a prototypical lefthanded-hitting, leadoff centerfielder … led UTSA to series win (11–5, 2–8, 8–5) vs. cb360 #44 Louisiana-Lafayette team that still boasts several key pieces from its 2014 team that nearly reached the College World Series … team’s top hitter vs. the Cajuns with .455 batting (5-for-11) – including 1st-inning leadoff home runs in both the series opener and the finale … also paced the Roadrunners with six runs scored in the series while reaching base eight total times, thanks to a pair of walks and one time hit-by-pitch … his first DI at-bat was a memorable one, leading off the bottom of the 1st in the series opener by pulling a Chris Carpenter 0–2 pitch over the fence in right-center … came to play in game-2, batting 3-for-4 and scoring a run (the rest of the UTSA offense hit only 4-for-29) … reached base four times in the series finale – and scored on all of them, after batting 1-for-2 with the two walks and HBP … reprised his bottom of the 1st leadoff home run in game-3, working ahead in the count before deposting a Greg Milborn 3-1 pitch over the right field fence … in-state product from North Central Junior College and Willis High School … his uncle Thomas Mileski – who also starred at Willis (and San Jacinto JC) – played in the Texas Rangers organization during the late 1980s. 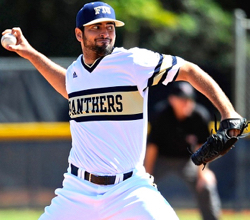 Florida International … RHP … So. Second-year starter who is looking to compile another strong season, after earning 2014 Conference USA Freshman of the Year honors … delivered five strong innings (in a planned 75-pitch count) to front a four-pitcher shared shutout, as FIU knocked off Tennessee (cb360 #30) in the decisive third game of that Opening Week series (4–3, 2–9, 3–0) … effective keeping the ball down in the zone, with 12 of his 15 outs staying in the infield (three strikeouts and nine groundouts) … faced only three batters over the minimum, after allowing only one hit and a pair of walks … retired the first 11 he faced, before yielding a 2-out, full-count walk in the 4th (a 1-out double in the 5th produced the Vols only runner in scoring position during his five innings) … newcomers Ian Exposito, Gianni Mayas and Danny Dopico completed the series-winning shutout … his impressive freshman season in 2014 included a 1.95 ERA and 9–3 record in 12 starts (15 appearances, 37 Ks, 11 BB in 78.1 innings) … played during the summer of 2013 with the elite Midland Redskins club team (based in Batavia, Ohio) … local product from Southwest Miami High School. 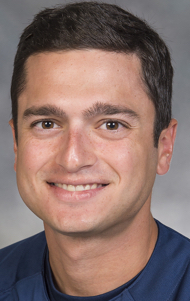 Veteran infielder who packs plenty of talent into his 5-foot-5 frame, most recently during action in Clearwater, Fla., against three top opponents … hit at a .545 clip (5-for-11) during Opening Week – highlighted by playing a lead role in the Hornets 3–2 win over Cal State Fullerton (cb360 #16) … his totals for the week also included two RBI, a pair of runs scored, two doubles and a stolen base (plus only one strikeout in 12 total plate appearances vs. quality pitching) … also played error-free in 13 fielding chances (including eight assists), while playing at both third and second base … collected hits in all three games – including the only hit allowed by Louisville All-American Kyle Funhouser in his dominating seven innings (the Cardinals, cb360 #10, won 5–1) … jumped all over a first-pitch offering from Funkhouser and singled into left field during the first inning … sparked Hornets to the 3–2 win over Fullerton from his 2-spot in the lineup, batting 3-for-4 with an RBI, run scored and double … his double down the leftfield line helped get things going vs. the Titans in a 3-run top of the 6th, yielding the eventual final margin … the next day, his leadoff double (on a 2-2 pitch to the opposite right field) ignited another 3-run rally, cutting tournament host South Florida’s lead to 4–3 … the Bulls went on to a 12–4 win, but his productive game included batting 2-for-3 with a walk and stolen base … named first team all-SWAC in 2014, after batting .346 in the regular season while twice compiling on-base streaks that surpassed 20 games (his .478 on-base pct. 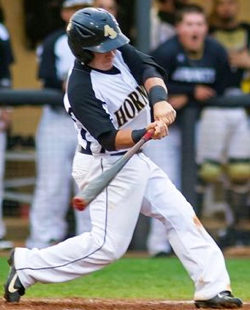 ranked second in the league) … nearly helped lead Alabama State to the 2014 NCAAs, as the Hornets lost a 9–8 heartbreaker vs. Jackson State in the SWAC title game (Jackson State went on to open the NCAAs with a win at Louisiana-Lafayette) … key member of 2014 team that won all of its SWAC series and posted notable non-conference wins over 4th-ranked Miami and Auburn (three members of the 2014 team were drafted, including SS Emmanuel Marrero in the 7th round by the Phillies) … product of Tampa’s Jefferson High School. 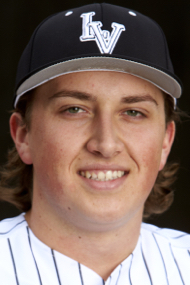 UNLV … RHP … So. Transfer addition who appears poised to play a key role in the 2015 UNLV rotation, following his impressive DI debut against Nebraska (cb360 #26) in the series-deciding game that capped Opening Week (the Huskers had won the opener, 2–0, while the Rebels had a 5–3 win in gm-2) … his 7.2 shutout innings led the way in the 3–0 series finale, scattering three hits and only one walk while striking out five in the 97-pitch outing … did not allow a hit until the fourth inning, with only one runner reaching scoring position (none made it to third base) during the 7.2 innings … spent his first year of college baseball on the JC level, playing at the College of Southern Nevada … in-state product from Coronado High School. 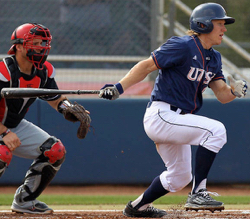 note – UNLV action photo of Myers not currently available. Delivered both quantity and quality when it came to his offensive production during Opening Week series sweep of cb360 #41 UC Irvine, as Bulldogs won three straight tight finishes (5–4, 7–5, 7–5) vs. team that still includes several key players from the UCI squad that reached the 2014 CWS … hit .583 (7-for-12) in the series, also reaching via a walk, while factoring into seven of the team’s runs (5 RBI, 3 runs, home run) … added another productive plate appearance with a sacrifice bunt from his 2-hole spot in the lineup … his game-1 contributions (3–3; RBI, R, BB, sac) included the leadoff, 9th-inning single that sparked the winning rally … the next day, he singled home the tying run in the 7th and scored moments later on Taylor Ward’s triple … closed weekend by batting 3-for-5 in the series finale – including an RBI single that sparked a 2-out rally in the 7th, cutting UCI’s lead to 5–1, before launching a 2-run blast in the 8th for a 6–5 Bulldogs lead … served most of the 2014 season as the team’s starting centerfielder … product of Centennial High School. Sizzled in Opening Week while playing in the nation’s premier week-1 series, as Owls split four games vs. cb360 #9 Texas team that features several top returners from its 2014 CWS squad (the Owls swept the Sat. DH, 10–9 and 5–2, while the ‘Horns won 3–1 on Fri. and 4–3 in 10 inn. on Sun.) 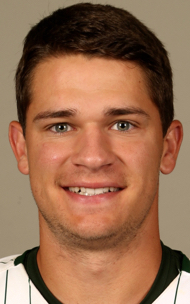 … somewhat of a surprise series hero, after playing mostly in a reserve role earlier in his career … hit at a .643 clip (9-for-14) across the four games, with four RBI, two runs scored and a pair of RBI while batting mostly near the bottom of the lineup … amassed a lofty 1.453 OBS (.667 on-base plus .786 slugging pct.) 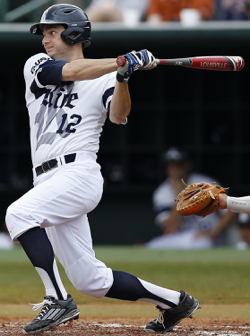 that included an intentional walk in the 8th inning of the finale, with the score 3–3 … went 1-for-2 in the opener, after entering as a pinch-hitter … hit safely in all four games, including the first three-hit games of his Rice career … went 2-for-4 (RBI, R, 2B) to help even the series in game-2, with an RBI single up the middle in the 6-run bottom of the 1st and later what proved to be a valuable opposite-field double (to right-center) and insurance run scored in the 7th (10–7; with a 10–9 final) … bumped up to the 5-hole for gm-3 and delivered a 3-for-4, 3-RBI game that included an early run-scoring single up the middle and a 2-run single to the left-center gap in the 5th … capped the series with another 3-for-4 (back at the 8-hole) that featured an early 2-out single moving the lead runner to third, plus a single through the left side (and run scored) in the three-run bottom of the 5th (he was left stranded in the 6th, after a 2-out double down the leftfield line) … hit .355 in 62 at-bats during the 2014 season, with 11 starts on the right side of the infield or at DH – after appearing in only 12 games (four starts) in 2013 … began his college career at Texas A&M (five games played, in 2011) before spending the 2012 season as one of the top players for the national runner-up team at San Jacinto College (where Rice’s Wayne Graham began his collegiate coaching career) … in-state product who earned honorable mention All-America honors at Bellaire High School. 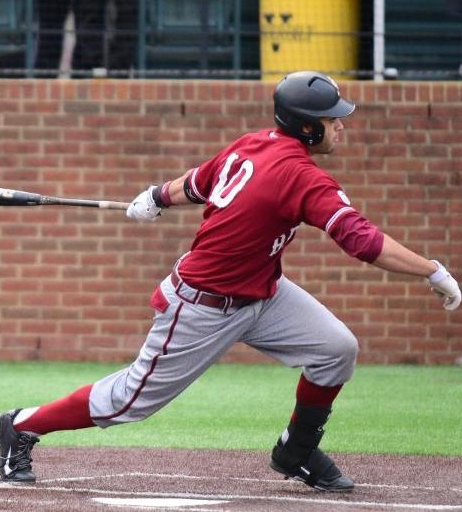 Namesake son of the former longtime major leaguer, making his dad proud during Opening Week with strong series at top-ranked and defending national champion Vanderbilt (SCU nearly swept doubleheader, with series decided in 10th inn. of gm-3) … reached base in his final seven plate appearances – including 9th-inning sequence that produced tying run and eventual winning run in gm-2 (7–6) … hit 5-for-10 while also drawing four walks (.667 on-base), with an RBI, two runs scored, a double and pair of stolen bases … also played error-free across 13 fielding chances, including six assists and helping turn a pair of double plays (while playing with three freshmen at the other infield positions) … opened his season by pulling a 1st-inning double down the leftfield line vs. All-American Carson Fulmer (who allowed only one other hit in his 5.0 innings) … opened Sat. doubleheader by batting 2-for-4 with a walk, two stolen bases and a run scored, as SCU answered two VU runs in the 8th with two in the top of the 9th en route to 7–6 upset win … his 2-out single through the left side helped produce the final score in SCU’s three-run top of the 4th (for 4–3 lead) … with Broncos trailing 6–5 in the 9th, he followed a Grant Meylan walk with an opposite-field single into right field, then stole second and ultimately scored the decisive run on a steal of home (missed squeeze bunt) … reached base in all six of his gm-3 plate appearances (2-for-2, 4 BB; RBI, R), during that 6–5, 10-inn. loss … his leadoff walk in the 3rd led to three SCU runs and 4–2 series finale lead, adding a clutch 2-out RBI single through the left side in the 4th (5–2) … capped his big series with 2-out walk in the 10th (runner on 2nd), but SCU failed to score … earned first team all-West Coast Conference honors in 2014 (hit .323; 56 starts mostly at shortstop) … southern California native and product of Francis Parker School, where he also played soccer … father Jose Vizcaino, Sr., played 18 Major League seasons (’89-’06), spanning stints with the Dodgers, Cubs, Mets, Indians, Giants, Yankees, Astros and Cardinals (1,453 career MLB hits) … the elder Vizcaino holds the rare distinction (along with Daryl Strawberry and Ricky Ledee) of being the only MLB players to have played for all four of the one-time New York franchises (Yankees, Mets, Dodgers and Giants) … since 2008, Jose, Sr. has worked for the Dodgers in their baseball operations division, currently as a special assistant for player personnel … his brother-in-law Bob Scanlan (the uncle of Jose, Jr.) was a big-league righthanded pitcher from 1991-2001, with the Cubs, Brewers, Tigers, Royals, Astros and Expos (with 39 starts among his 290 career appearances) … Scanlan has served for the past couple years as a color analyst for San Diego Padres radio (previously with Padres TV as well). 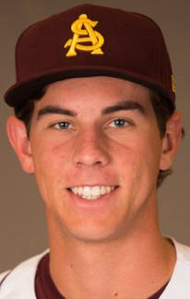 Launched pair of home runs from bottom-third of the lineup while collecting three other hits and playing error-free at shortstop, leading ASU to marquee series win vs. visiting Oklahoma State (cb360 #7) … slugged at a .923 clip (5-for-13, with the 2 HR and a double) while totaling three RBI and four runs scored … executed all 10 of his fielding chances up the middle, including seven assists and helping turn a pair of double plays … factored into three of the ASU runs (2-for-5, 2 RBI, 2 R, HR) in 4–3, 10-inning game that opened the season in thrilling fashion … pulled 1-out single through the left side and later scored, as Devils took 2–0 lead in the 4th … dramatically ended the game leading off the bottom of the 10th, after turning on a 1–2 pitch and depositing it over the leftfield fence … had hits in all three games, including single in game-2 (5–3 win) … closed the weekend batting 2-for-4 (RBI, 2 R) in series finale, sparking ASU comeback from early 6–0 deficit (OK State won 9–8) … his first-pitch double (down the leftfield line) and run scored helped the Devils score three in the 4th … cut the deficit to 9–7 in the 7th, after working ahead in the count (3–1) and sending another solo shot to left … started 24 games at shortstop as a freshman in 2014 … in-state product from Desert Vista High School. 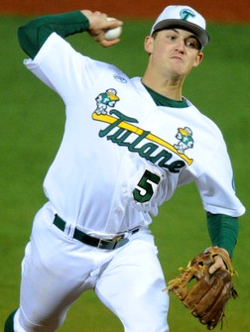 Two-way talent whose production in series win at Pepperdine (cb360 #45) included hitting his first career home run and logging 6.1 shutout, no-hit innings in his first career collegiate start, as Green Wave nearly swept team that returns several top players from squad that was three outs from reaching the 2014 College World Series … despite having pitched a total of only 18 innings (all in relief) during his fist two seasons, he took the ball with confidence as gm-3 starter at Pepperdine, holding the host team without a run or hit while pitching into the 7th (Pepperdine rallied in the 9th for a 2–1 win that spoiled his outing) … also issued only two walks (plus a hit batter) while striking out five … impressively allowed only two balls out of the infield throughout his 6.1 innings – with his 19 outs also including eight groundballs, an infield lineout double play, and two foulouts … likely could have pitched even deeper into the game, but his pitch count was extended by three errors from the defense behind him … had not pitched longer than 3.0 innings previously in his college career … in series-opening win (9–3), pulled a two-run home run to left field as part of six-run bottom of the 6th that yielded 6–2 lead … also drew a key walk in gm-2 (9–5 win), as Tulane scored four in the 8th (followed by five in the 9th) to stunningly clinch the series … the home run at Pepperdine was the first of his college career, after playing in 45 games (35 starts) as a freshman and 13 in 2014 (six starts), filling roles at various infield and outfield positions … did not pitch as a freshman before logging 18 relief innings in 2014 (1–1 with a save, 11 Ks and 0.50 ERA) … Georgia product from Etowah High School.